If you know me AT ALL you know I love quick and easy recipes. I’m currently enjoying the Sheet Pan Dinner trend myself. Put everything on one or two pans, toss in the oven and done in under half an hour? Count me in! Not only is meal prep quick and easy but clean up is a breeze too. And the variations are endless, you can make just about anything a sheet pan dinner. 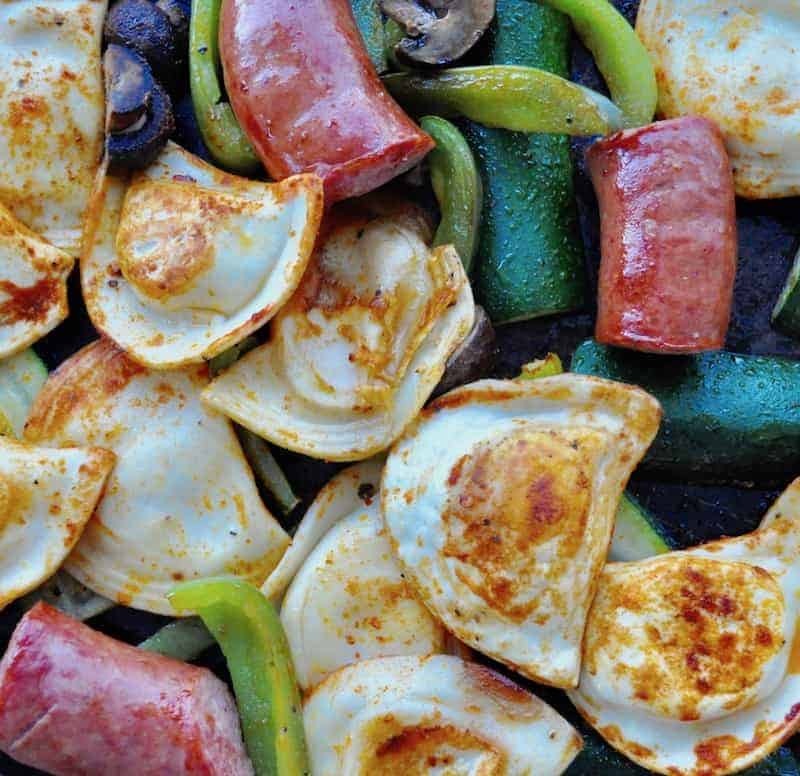 This recipe for Kielbasa and Pierogi Sheet Pan Dinner uses frozen pierogis. It’s one I’ve been making for a few years and everyone asks for it when I’m making a meal plan. You can’t beat the combo of pierogies and kielbasa roasted together in the oven. Sheet Pan Dinners seem to be the new rage but I think they’ve been around for a long time and people are just rediscovering them. Anyone remember shake– bake and putting potatoes around the pork chops to make it a meal? Yep, I do! One thing I’ve found and LOVE is using frozen pierogies in sheet pan recipes. Seriously they puff up, get crispy, yet are full of fluffy potatoes and cheese and oh man they are just delish! If you’re looking for another recipe using frozen pierogies check out my Italian Sausage and Pierogi Sheet Pan dinner–SO AMAZING! Quick and Easy is always the name of my game, especially as Spring starts to roll around. As the days get longer we get more and more active outside. We’ve got chickens, soon we’ll have chicks, and then it’s time to tap our birches (did you know you can make Birch Syrup in your Instant Pot?  ), pretty soon it’s Summer and we’re just full tilt until Fall. I like to make my time in the kitchen short and sweet most days so that on other days I can make more complicated recipes or experiment with making homemade versions of store-bought faves. Kielbasa and Pierogies Recipes PLEASE! Basically, give me any recipe with Kielbasa and Pierogies in it and I’m happy! 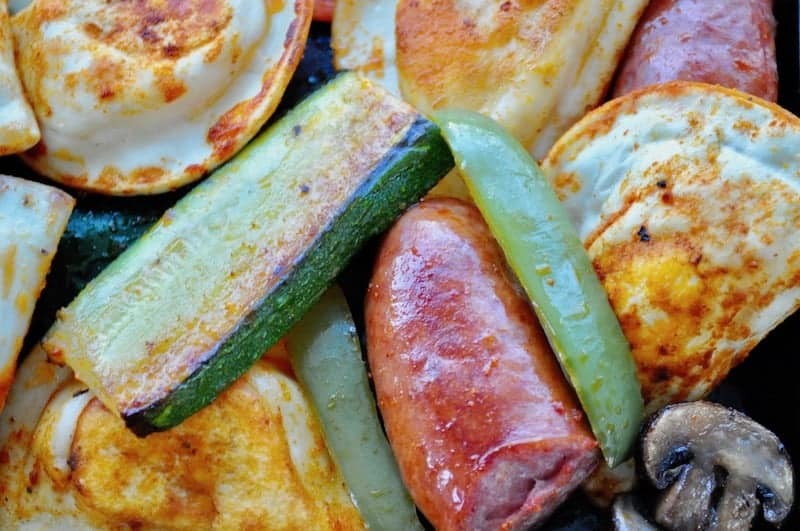 This recipe for Kielbasa Pierogies Sheet Pan Dinner was originally from Foodie With Family but since my guys like more vegetables I’ve added more, like mushrooms and zucchini and tweaked it just a bit. I use Sriracha but you can totally leave it out if you don’t have it in your house. Use what whatever hot sauce you do have on hand. Or completely leave it out if you don’t like heat. Most of the flavor comes from the sausage and pierogies so you won’t miss the hot sauce at all. Promise! 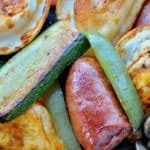 I made kielbasa and pierogis all the time as a skillet dinner- love this as an easy sheet pan meal! Love sheet pan dinners….especially when they are full of yummy veggies and pierogies!! Pinned! My husband will love this easy peasy sheet pan dinner. Thanks for sharing. I’m LOVING the sheet pan dinner craze lately! This looks like a super tasty meal! I love sheet pan dinners but would never have thought to make them with pierogies! I love quick and easy too! I haven’t had pierogies since finding out I can’t handle gluten. I really should try making a GF version sometime. 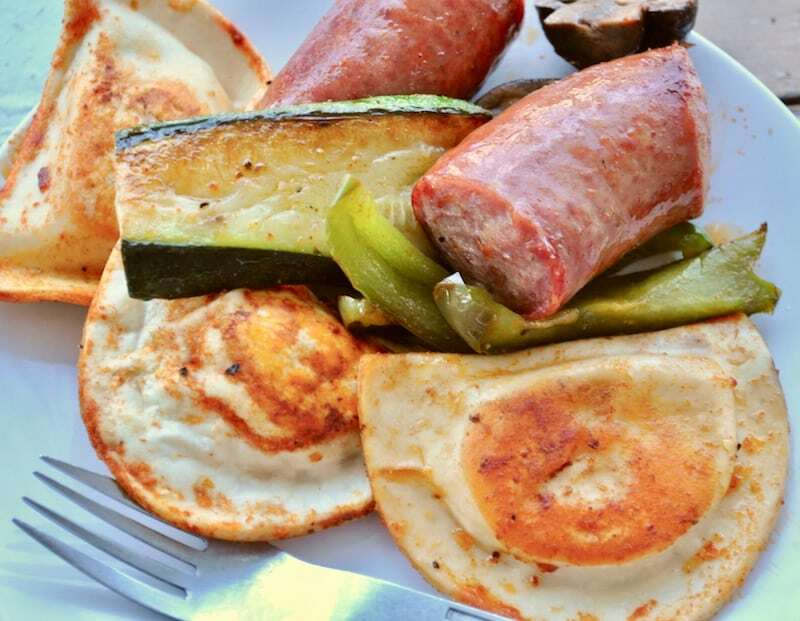 Love the added kielbasa to them, this sounds so delicious!